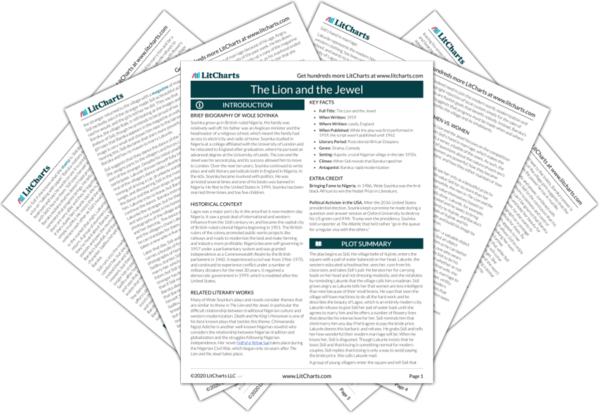 Instant downloads of all 942 LitChart PDFs (including The Lion and the Jewel). 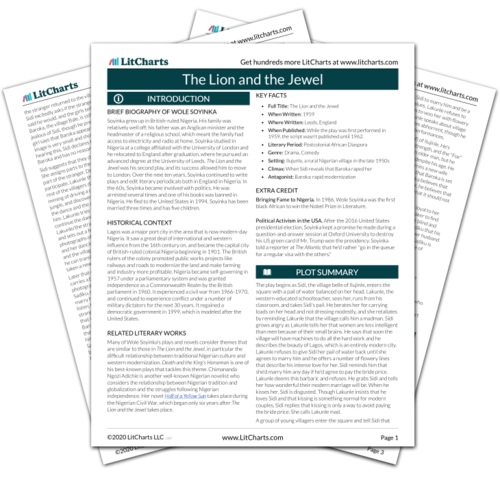 Welcome to the LitCharts study guide on Wole Soyinka's The Lion and the Jewel. Created by the original team behind SparkNotes, LitCharts are the world's best literature guides. A concise biography of Wole Soyinka plus historical and literary context for The Lion and the Jewel. A quick-reference summary: The Lion and the Jewel on a single page. In-depth summary and analysis of every Scene of The Lion and the Jewel. Visual theme-tracking, too. Explanations, analysis, and visualizations of The Lion and the Jewel's themes. The Lion and the Jewel's important quotes, sortable by theme, character, or Scene. Description, analysis, and timelines for The Lion and the Jewel's characters. Explanations of The Lion and the Jewel's symbols, and tracking of where they appear. An interactive data visualization of The Lion and the Jewel's plot and themes. Soyinka grew up in British-ruled Nigeria. His family was relatively well off; his father was an Anglican minister and the headmaster of a religious school, which meant the family had access to electricity and radio at home. Soyinka studied in Nigeria at a college affiliated with the University of London and he relocated to England after graduation, where he pursued an advanced degree at the University of Leeds. The Lion and the Jewel was his second play, and its success allowed him to move to London. Over the next ten years, Soyinka continued to write plays and edit literary periodicals both in England in Nigeria. In the 60s, Soyinka became involved with politics. He was arrested several times and one of his books was banned in Nigeria. He fled to the United States in 1994. Soyinka has been married three times and has five children. 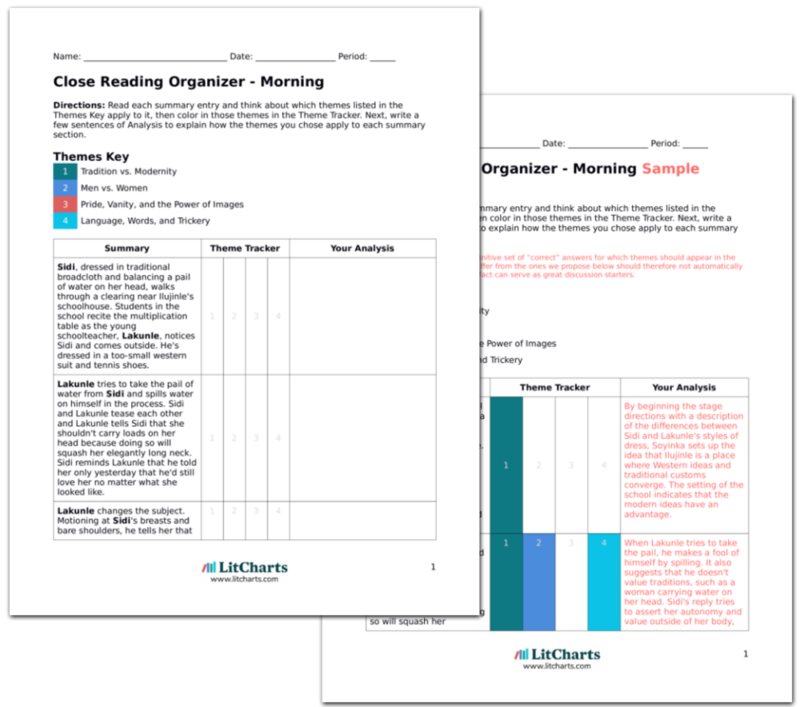 Get the entire The Lion and the Jewel LitChart as a printable PDF. Lagos was a major port city in the area that is now modern-day Nigeria. It saw a great deal of international and western influence from the 16th century on, and became the capital city of British-ruled colonial Nigeria beginning in 1901. The British rulers of the colony promoted public works projects like railways and roads to modernize the land and make farming and industry more profitable. Nigeria became self-governing in 1957 under a parliamentary system and was granted independence as a Commonwealth Realm by the British parliament in 1960. It experienced a civil war from 1966-1970, and continued to experience conflict under a number of military dictators for the next 30 years. It regained a democratic government in 1999, which is modeled after the United States. Many of Wole Soyinka's plays and novels consider themes that are similar to those in The Lion and the Jewel, in particular the difficult relationship between traditional Nigerian culture and western modernization. Death and the King's Horseman is one of his best-known plays that tackles this theme. Chimananda Ngozi Adichie is another well-known Nigerian novelist who considers the relationship between Nigerian tradition and globalization and the struggles following Nigerian independence. Her novel Half of a Yellow Sun takes place during the Nigerian Civil War, which began only six years after The Lion and the Jewel takes place. When Published: While the play was first performed in 1959, the script wasn't published until 1962. Bringing Fame to Nigeria. In 1986, Wole Soyinka was the first black African to win the Nobel Prize in Literature. Political Activism in the USA. After the 2016 United States presidential election, Soyinka kept a promise he made during a question-and-answer session at Oxford University to destroy his US green card if Mr. Trump won the presidency. Soyinka told a reporter at The Atlantic that he'd rather "go in the queue for a regular visa with the others." Brock, Zoë. "The Lion and the Jewel." LitCharts. LitCharts LLC, 7 Sep 2017. Web. 19 Apr 2019. Brock, Zoë. "The Lion and the Jewel." LitCharts LLC, September 7, 2017. Retrieved April 19, 2019. https://www.litcharts.com/lit/the-lion-and-the-jewel.